Predatory practices of car sales has never worked in the long term for anyone. Looks like Hyundai is having some serious financial issues right now because of it. 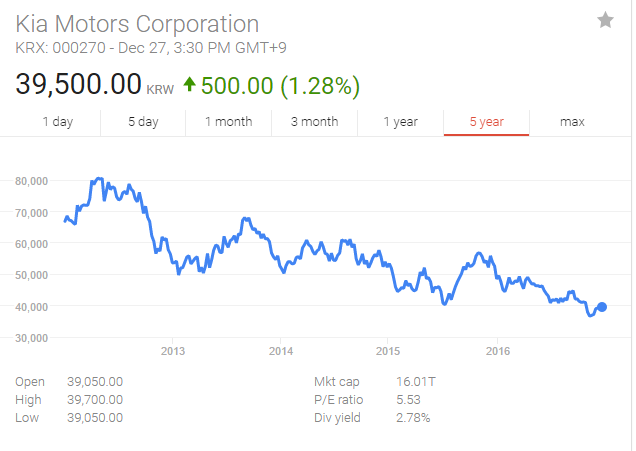 Kia’s stock is sliding pretty bad along with it. The car market isn’t booming like it was in 2015, but the slide is far worse for Kia. Their abuse is finally catching up to them. I feel bad for their working people that are losing jobs, but they can blame the corporate greed and policies for that. Kia, are you going to start honoring the warranties that you sell? If not, the world will continue to see you as the slum lords of the automotive market, and you will never be able to sell the higher priced, more profitable vehicles that you need to recover. People want power and luxury. Just not from you. Previous PostI made a mistake..
KIA has to be taking a bath on that 100K warranty on these lemonade stands. I am concerned my trade-in value is going to be nothing.